If a message appears about a certificate issue when you open a website, it means the website might not be secure. Should this be the case, your account details and other personal information could be stolen by criminals. We therefore recommend that you don’t open websites with certificate issues. A certificate is a digital signature which ensures that the user’s connection to the website is encrypted. It also confirms that the website is genuine. If you are certain that the website is safe, click Continue or I understand the risks and wish to continue. 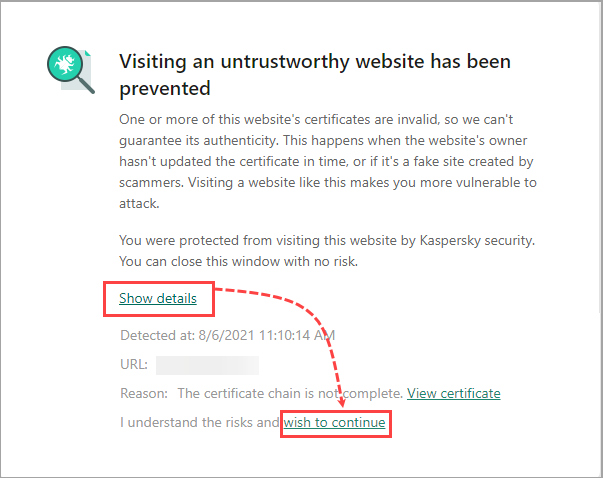 If you want to exclude the website from encrypted connections scanning, install a Kaspersky Lab application with extended features, such as Kaspersky Internet Security or Kaspersky Total Security. The certificate has been revoked. For example, the website’s owner might have requested that the certificate be revoked if the site was hacked. The certificate was issued illegally. A certificate must be obtained from a special, authorized center (certificate authority) after undergoing the necessary checks. The certificate chain is broken. Certificates are checked along a chain. The chain goes from a self-signed certificate to a trusted root certificate, which is provided by a certificate authority. Intermediate certificates are intended for signing (verifying) another certificate in the chain. The chain consists of one self-signed certificate. Self-signed certificates are not authenticated by a certificate authority and might be unsafe. The root or intermediate certificate has expired or has not yet become active. Certificate authorities give out a certificate for a certain period of time. The certificate is not meant to confirm the node authenticity. For example, the certificate is only intended for encrypting the connection between the user and the website. Usage policy violation. A certificate policy is a set of rules that determine the use of the certificate with specified security requirements. Every certificate should comply with at least one certificate policy. If multiple policies are in use, the certificate should comply with all of them. The structure of the certificate is damaged. An error occurred when checking the certificate signature.